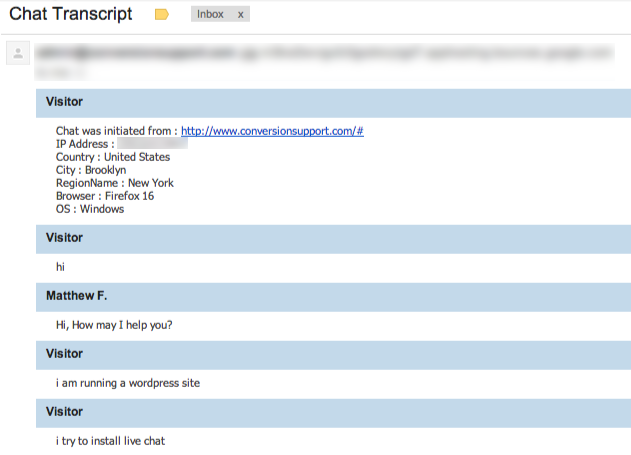 Conversion Support has a very useful “Transcripts” feature which automatically saves chat conversations within your Conversion Support account console. Chat transcripts are particularly useful when you want to refer to old conversations for information that you might have forgotten. 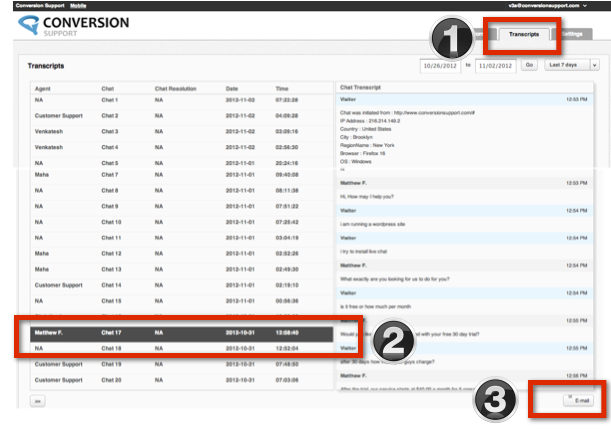 Also, you can use to save chat transcripts to know the date and time of a specific chat conversation, refer to old messages for more information and know how a specific chat conversation had happened in the past. This greatly helps in knowing the priorities and needs of the lead, so you can plan the next approach accordingly. Apart from reading chat transcripts from your Conversion support account console, did you know that you can chat transcript to any email address, directly from your Conversion Support account? 2. Navigate to the “Transcripts” tab, select the “Transcript” and click the “Email” button. 3. You can email the transcript to any email address, not just your own. The page chat was initiated. That’s pretty good volume of information, isn’t it? This entry was posted in Uncategorized on May 1, 2014 by Mayank.